Summary : Lou Clark knows lots of things. She knows how many footsteps there are between the bus stop and home. She knows she likes working in The Buttered Bun tea shop and she knows she might not love her boyfriend Patrick. Louisa Clark is a bit stuck with her life. She has a boyfriend who thinks a running track is more attractive than her, she still lives with her parents, the only job she’s ever had in six years has sacked her and you can’t buy yellow and black stripy tights for adults. That is until she meets Will. Will is a quadriplegic who is a little bit stuck as well. He hates his life, he hates relying on people to look after him. And Louisa has just six months to change his mind. It took me a very long time to pick up this book. When it was first released on to shelves back in 2012, I remember picking it up and putting it back down because I wouldn’t like it. The blurb did not make it sound interesting at all and I thought it was just another chick-lit novel that would be left on my shelf. It wasn’t until Giovanna Fletcher recommended it on her YouTube channel and the movie was set to be released that I decided to pick it up (okay it sat on my shelf for a year before I actually decided to pick it up). How very stupid I was. Yes this novel is chick-lit. Yes it is a classic case of ‘I really love him but I don’t know it’ and yes it is a little bit cliché. But how well this novel is written makes you forget about all of that. 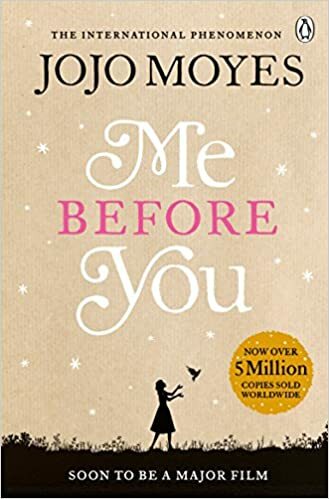 JoJo Moyes somehow has the incredible talent of taking a novel that would be boring a turning it in to an incredible fairytale. I have no enjoyed the writing of a chick-lit novel for a long time, and this completely changed my option after I was losing hope. I completely fell head over heels for the characters. Especially Will. He is funny and charming and everything you want from a leading man. He injects a wonderful sense of humour in to the novel that is dry and makes you laugh out loud. Louisa is eccentric but in a wonderful way. You end up loving her and her quirks all the same. I usually cannot stand the female leads in these types of novels but I adored her. Obviously, this book is sad. Anything about a lost love in the realm of illness will never not be soul destroying. But the story was told so beautifully you forget how sad the situation these characters are in is. I honestly don’t have a bad word to say about Me Before You. I absolutely adored every part of it. I’m excited to see what the movies holds, but I’ll make sure to pack a box of tissues (or five). Get your copy of Me Before You by clicking this image!